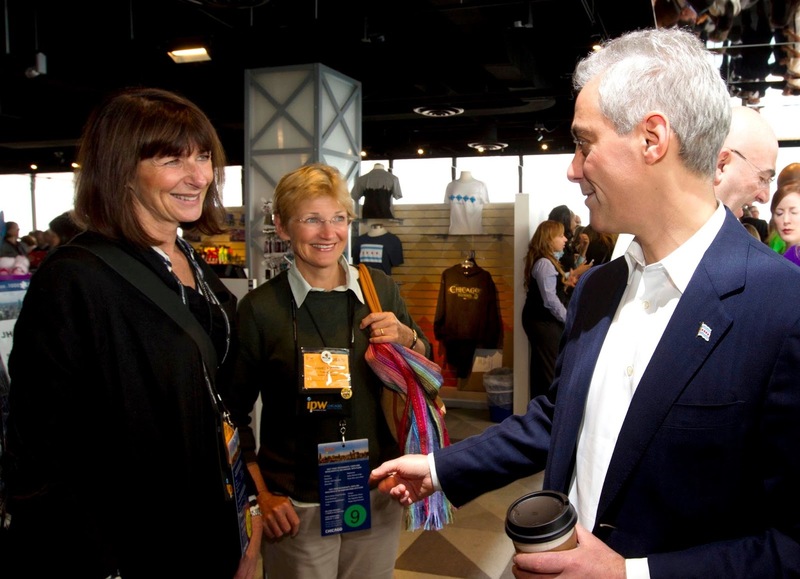 Here I am, about to shake the hand of the Mayor of Chicago, the oddly-named Rahm Emanuel, a professional charmer (that's my excuse for my possum-in-the-headlights impression) and enthusiastic proponent of tourism to his city. We met - if you can call it that - at the IPW media brunch in the Observatory at the top of the Hancock building with its extensive views over the city and the lake. There was also a bird's eye view of a greeting written in the sand of the beach 94 storeys below, which was just one of the many, many thoughtful touches that made us all feel that Chicago was really pleased to have us there. I'm really looking forward to returning to the city in October, and having a proper look at it. I'm going to do the architectural cruise that others told me they enjoyed so much; I'm going to ride the El out to a couple of the score or so of distinctive neighbourhoods; I'm going to have a proper look around the Field Museum in which so far I've only seen Sue the T.Rex and about a thousand birds; I'll look at some art; I'll try the deep-dish pizza and local hot dog, though I don't expect to enjoy either of them; I'll catch some comedy if I can; and I may even venture into a shop or two. And, who knows, if the series goes into play-offs, I may get to see a baseball game at Wrigley Field. Now that would be a proper visit. That is exciting! Did her curse colorfully at all? He's know for that, and for being the brother of Ari, who is the inspiration for Ari Gold on Entourage. Well, no, he spoke very circumspectly. How disappointing. I didn't know that about his brother, but I'm not surprised he's from an, um, emphatic sort of family.